Project H’s designers faced a tough decision when redesigning a water transportation device–sustainability or social impact? In 2008, 26-year-old industrial designer Emily Pilloton founded Project H Design, a non-profit that empowers designers around the world to support, create, and deliver life-improving product design solutions. Chapters now located in nine cities function as volunteer design firms, identifying and developing products that address issues of the four H’s: Humanity, Habitats, Health and Happiness. As Pilloton worked to establish the first chapter, located in San Francisco, yet another H quickly came into the fold, the Hippo Roller, a water-transporting device manufactured in South Africa. Project H’s very first initiative became a plan to raise enough money to deliver 75 Hippo Rollers to Kgautswane, South Africa. 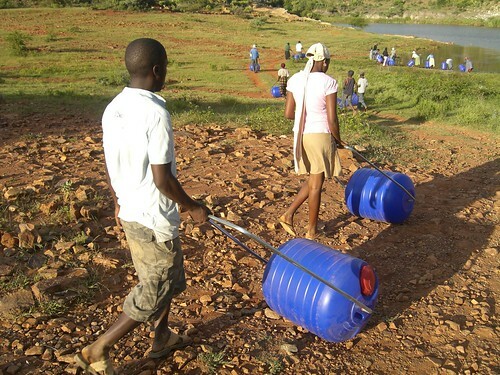 The first Hippo Roller recipients in Project H’s delivery to Kgautswane. When she got to South Africa, however, Pilloton quickly realized that the Hippo Roller had several design flaws. The factory was inefficient, for example, 120 rollers had to be manufactured in order to produce 75 useable rollers that were up to quality standards. The rollers–which are transported empty, like water-cooler bottles, and take up lots of space in a shipping container–were extremely expensive to ship outside of the country. 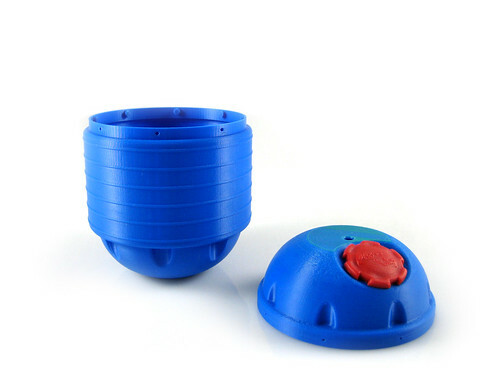 And in the field, she noticed many of the rubber o-rings that were supposed to keep the screwcap watertight had deteriorated, causing users to wrap plastic bags around the cap instead. Pilloton knew the “something else” of Project H’s role in this initiative would be to improve the Hippo Roller itself. She enlisted the assistance of Engineers Without Borders to propose a redesign. An early two-piece concept at a brainstorming session. 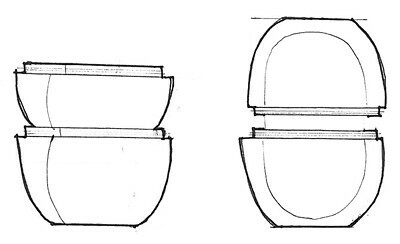 A early rendering of a modified two-part shape. As a designer exceptionally concerned with sustainability issues, when it came to materials Pilloton also hoped to improve upon the Hippo Roller’s design. Although they all hoped to make the new version out of recycled plastic, Pilloton learned immediately of the material’s shortcomings. “There were very real structural limitations,” says Pilloton. The supply of plastic to be recycled was one issue, and quality control was another–with recycled plastic it would be difficult to maintain a consistent texture, which was needed for designers to create a burly, all-terrain exterior of the roller. The designers quickly faced a dilemma: They could produce a superior product but it would not be produced in a more environmentally-responsible way. “We asked ourselves, is it worth it at all?” says Pilloton. “But we realized that the social impact was much more important. It was better that this would last for six years and work, rather than fall apart after three months.” They decided on a UV-stabilized polyethylene, a “middle of the road” plastic according to Pilloton–certainly not the most sustainable, but sturdy enough to contain massive volume of water. A 1/10-scale model built from the actual materials for testing. 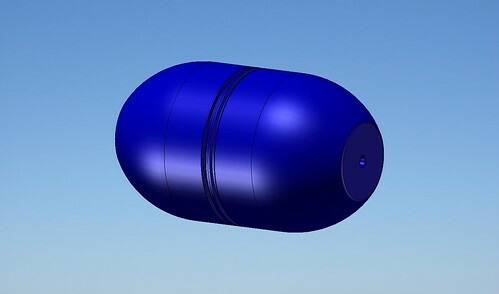 With an approved design, Project H hit another snag: Funds had dried up from their original initiative and no money was left to create the new tooling and mold for the revamped roller. Project H has embarked upon yet another fundraising campaign, hoping to provide the manufacturer with $9,000. Although it was a much longer timeline than Pilloton’s team anticipated, the entire process, like all Project H endeavors, has been carefully documented, allowing other designers to learn from their experience. Note: Emily Pilloton previously worked part-time for the Designers Accord but recently left her role at the organization to focus on Project H.
If you have a design and sustainability story to share, let us know about it! And follow us on Twitter @designersaccord to hear what the Designers Accord community is thinking about.